Club Ambience Beach Resort in Runaway Bay is only a 60 minutes drive from Montego Bay Airport and 25 minutes to Ocho Rios and the famous Dunn's River Falls. Club Ambience Is A Welcome Alternative To The Many Mega-resorts, Just A 60 Minute Scenic Drive From The Montego Bay Airport And 25 Minutes To Ocho Rios And Famous Dunn S River Falls. 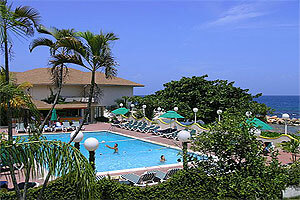 The Charming Casual Beach Resort Is The Perfect Get Away For Couples, Singles And Lovers. Guests Must Be At Least 18 Years Of Age. Club Ambience Is Located In Runaway Bay, Close To Where The Beauty Of Jamaica Was Discovered By Christopher Columbus In 1492. There Are 75 Standard Rooms And 15 Deluxe Honeymoon Rooms, All Decorated In Vibrant Caribbean Colors, And All Facing The Caribbean Sea. The Hotel S Restaurants Offer Ever-changing Menus.